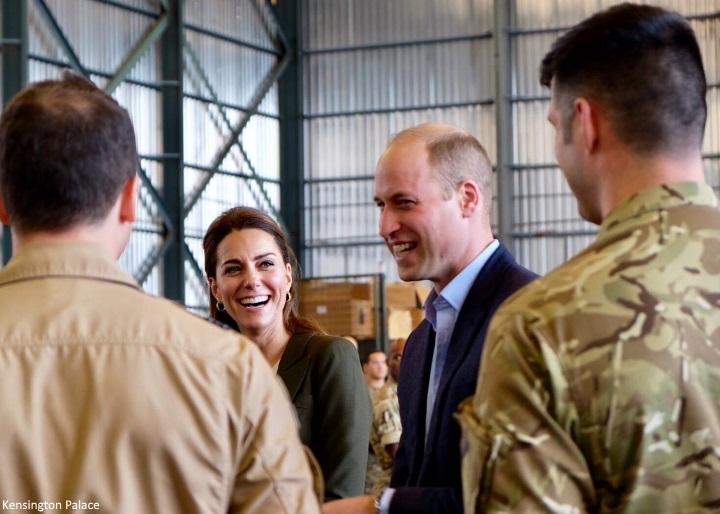 The Duke and Duchess of Cambridge travelled to RAF Akrotiri in Cyprus this morning to meet with Serving personnel, families living on the base, wider station personnel and members of the local community. RAF Akrotiri is home of the Cyprus Operations Support Unit which provides joint support to British Forces Cyprus and operations in the region to protect the UK’s strategic interests. 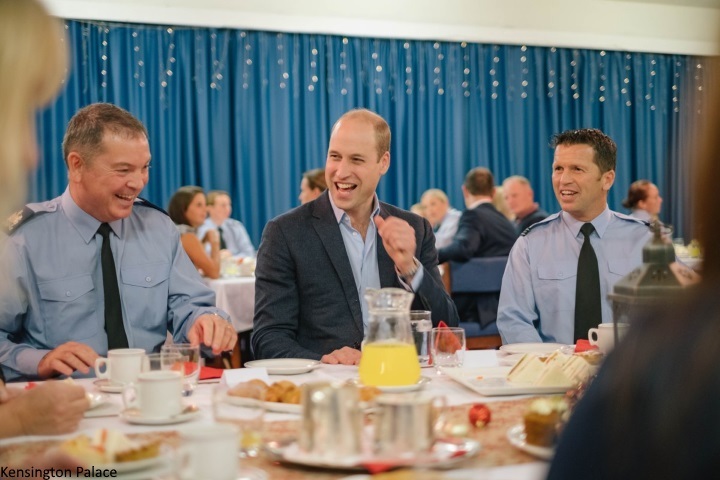 Yesterday, William and Kate hosted a festive-filled Christmas party for RAF Families at Kensington Palace. The children present made cards and took photos in a booth for William and Kate to take to their loved ones in Cyprus today. It's undoubtedly the most difficult time of year for a parent to be separated from their child. The sacrifice those in the military make in service of their country year after year is incredible and truly selfless. The little ones at the party yesterday will love seeing photos from today's visit and the knowledge their cards and gifts were delivered by a Prince and Princess. 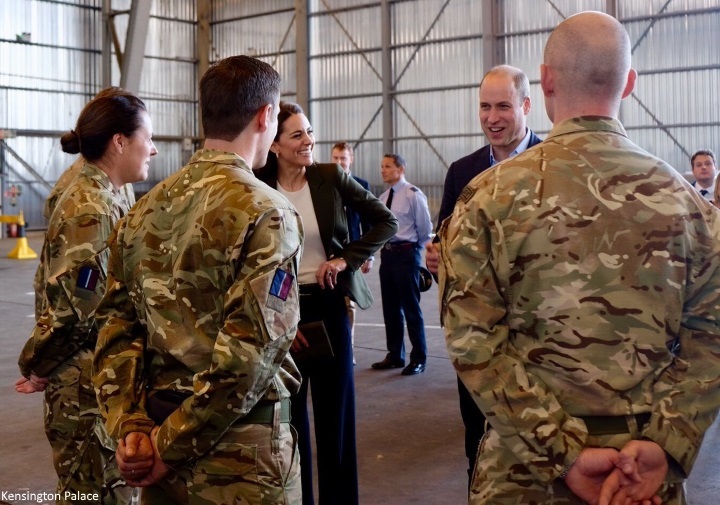 A couple of you mentioned the Cambridges should make this an annual engagement, focused on different bases and areas of the military each year. I couldn't agree more. 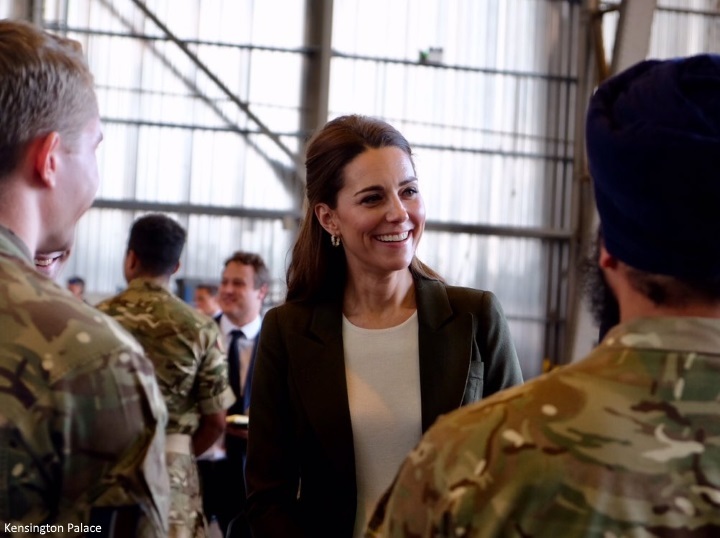 During a speech yesterday Kate said: "As someone whose husband has served, I know how hard it feels when a loved one leaves to do the job they trained for,” she said. “When William served doing search and rescue, I remember how I felt, but I can’t imagine how it feel when your loved ones are away on active service during Christmas. The absence of people you love must be especially hard at this time of year." 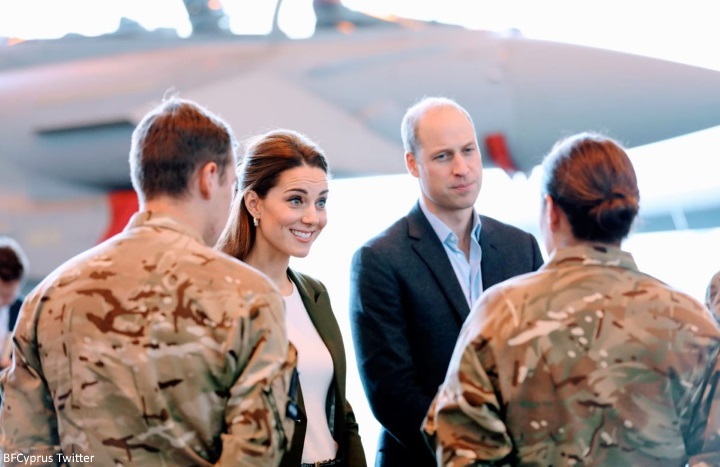 Upon arrival, William and Kate met deployed personnel from 11 and 31 Squadrons, operating Typhoon and Tornado GR4 Squadrons aircraft respectively, who are engaged on operations in support of Op SHADER, the UK’s contribution to the ongoing campaign against Daesh. They also meet personnel from the lead infantry company of 2 Mercians, who have recently been supporting Op TORAL in Afghanistan. 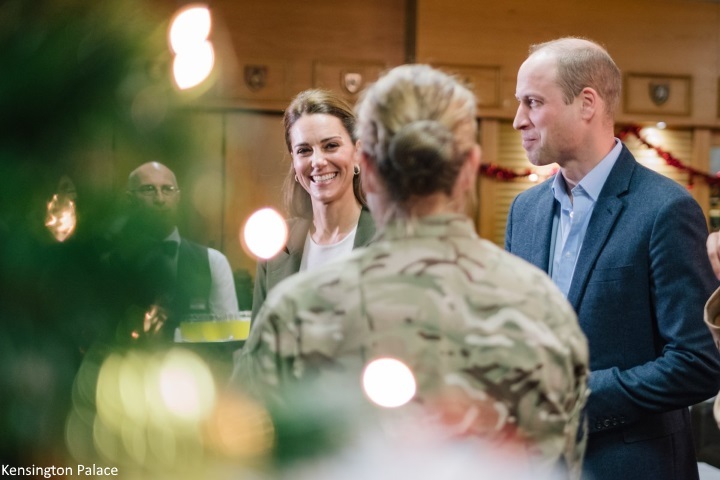 They spoke to personnel about the party at Kensington Palace and plans for Christmas. Hannah Furness reports a soldier said the visit was "important" and "really appreciated". 7,500 military personnel are currently serving overseas or away from home on exercises. A large portion of these have children who will have a parent away over the festive period. Prince William thanked those serving during a speech: "All of this work is done without fanfare. You don’t seek praise for your contribution. It’s not about credit or recognition - for you, it’s just about service. But as we approach Christmas, Catherine and I feel strongly that praise for your work and recognition of your sacrifices is exactly what is due to you all. From my time in uniform, we both know a bit of what it feels like to balance your work commitments with your family life." He continued: "You all put duty first. And so do your families, some of whom we had the chance to meet yesterday at a party at Kensington Palace. We know this isn’t easy for you or for your wives, husbands, children, and friends back in the UK. On behalf of everyone back home, we would like to say thank you." 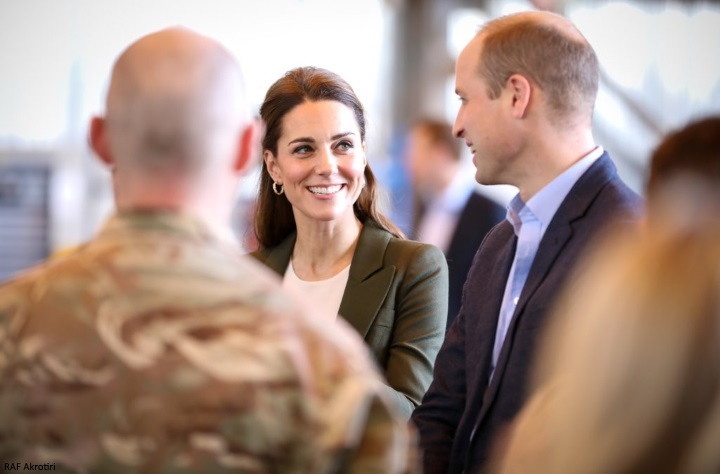 The Duke and Duchess visited and officially opened the Oasis centre which is used by Serving personnel on the base as a recreation area when they are not on shift. The centre has recently been renovated by staff working on the base, with trade work having been provided by members of the local Cypriot community. Before unveiling a plaque, William and Kate visited the cinema room and the video room where personnel can make private calls to their family and friends back home, and the café area which is run by CESSAC. CESSAC is The Church of England Soldiers’, Sailors’ and Airmen’s Club which operates amenity centres in military stations and other places at home and abroad and manages rented housing for elderly ex-Forces personnel and their families. The couple joined families at a Christmas reception. A nice video from the Christmas party. During a walkabout they met families living on the base. William meeting a shy little girl. Rebecca English said George asked him to take a photo of the helicopters before he left this morning. 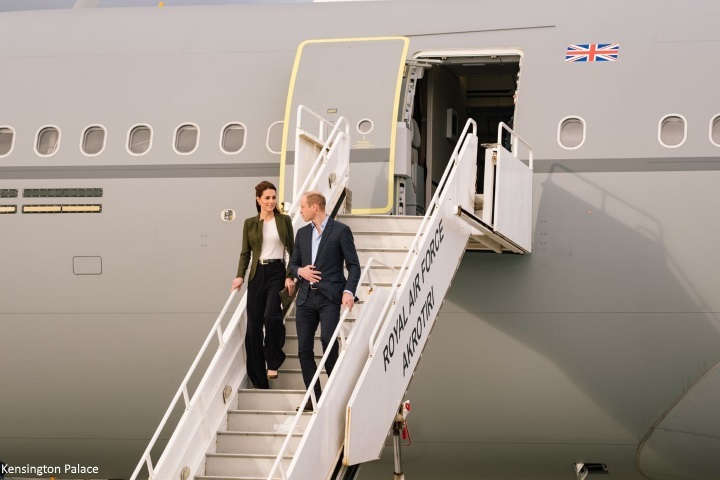 The Duchess opted for a green blazer, white top and navy wide leg trousers. I know many of you have been hoping to see Kate wear more trousers for official engagements for some time. It's a very professional look. Kate wore her Smythe Duchess Blazer. 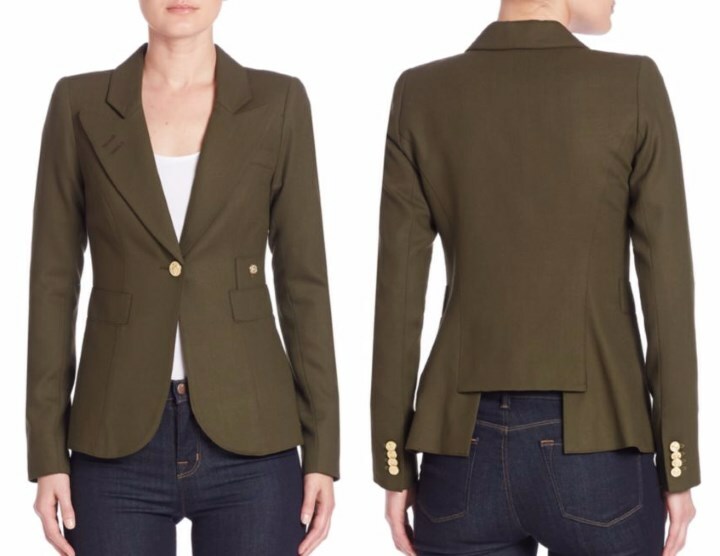 The army green blazer features peak lapels, long sleeves with button cuffs, front button closure, chest and waist welt pockets. The blazer is available in a number of sizes at Saks Fifth Avenue. Kate debuted the piece during the 2016 Canada tour. 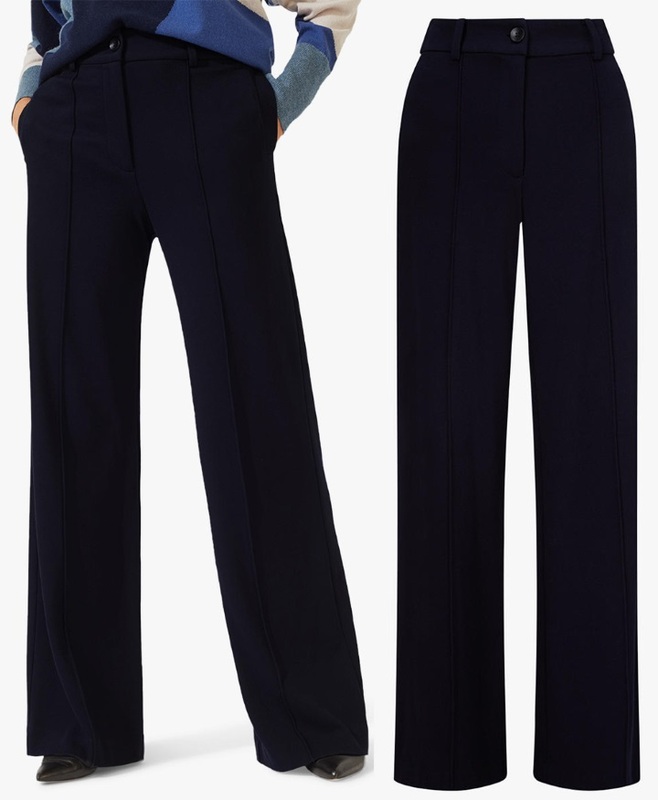 A closer look at Kate's navy trousers. Middleton Maven suggests they could be the £130 Jigsaw High Waisted Sport Luxe Trousers. Kate's green croc belt has been in her wardrobe for several years. Below, a closer look at the piece from St Patrick's Day 2014. Kate's carried the L.K. 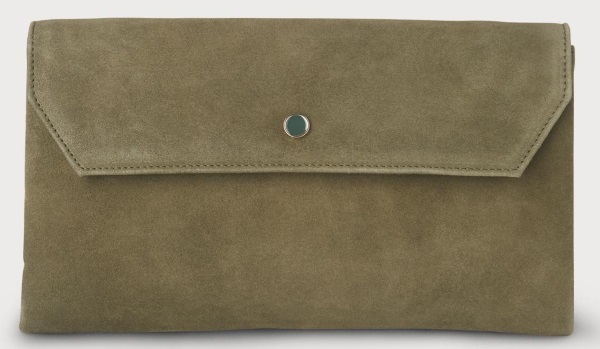 Bennett Dora khaki suede clutch (with thanks to Laura). It's currently on sale for £119. It is thought Kate's pumps are by Gianvito Rossi. 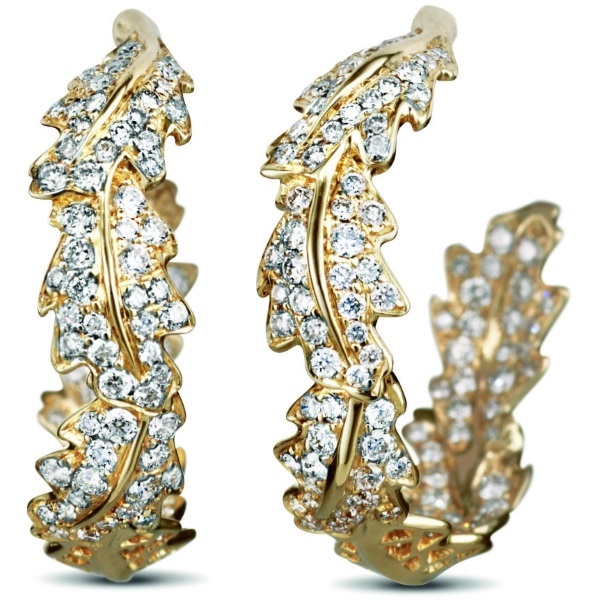 The Duchess accessorised with her Asprey Oak leaf earrings. 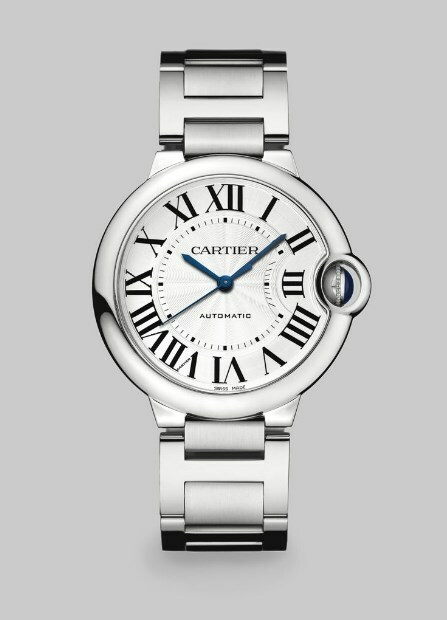 And Cartier Ballon Bleu watch. In other news, Kate took Charlotte to the Royal Opera House last Thursday for a rehearsal of The Nutcracker. The Duchess saw the production last year and obviously wanted to share it with her daughter. Both William and Kate have discussed Charlotte's love of dance, I imagine she had a wonderful time. There's one photo available to view on Instagram here. yes, she is. Catherine always looks great and comfortable in casual style. Kate looks great. This style looks good on her and seems more like Meghan's style, perhaps she has had an influence on her showing Kate that more casual looks can also be "acceptable" for official engagments. I think Catherine Quinn is having an influence on Kate, much more so than Meghan. I don't think Kate is looking to Meghan for inspiration. If anything, it's probably more the opposite. Kate has been known to step outside of her boxes once in awhile. This is just one of those times I think. It's a longish flight for a day trip. Maybe she wanted to be more comfortable today. Kate has been part of the Royal family for several years now. I don't think she needs Meghan to show her what is acceptable to wear. Other women in the Royal family have worn trousers to official engagements to obviously Kate knows it's acceptable to do so. She has usually chosen, I believe knowing her future role as Queen consort, to dress more formally for engagements. But she also has been known from time to time to wear something that is a departure for her. As much as I am happy to see her wear trousers today, my thinking is that it's not going to become a common occurrence. Maybe her inspiration was how the people she met would be dressed. There are men and women in a utility building wearing the everyday work uniform. I thought the outfit sort of dull/neutral until I saw the pictures with the service women and men, then I understood it. Anonymous 15:11--Yes, the photos with the service people are excellent. 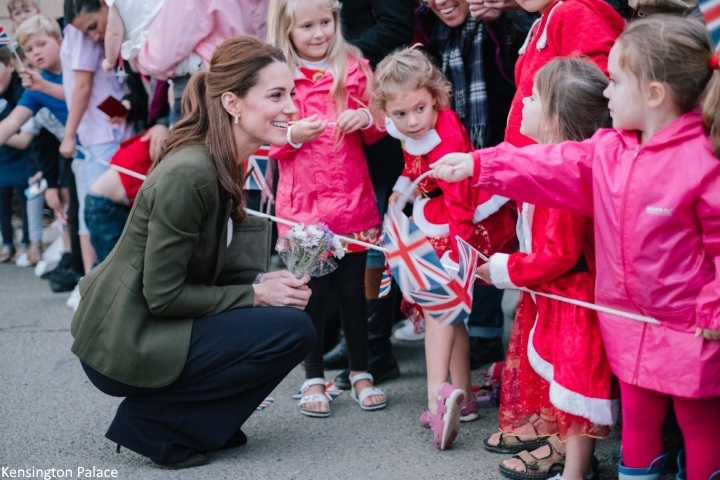 Kate has a knack for blending into the surroundings of the events she attends without looking like she's wearing a costume or making it about her. I think that Catherine Quinn is responsible for her increased confidence (or whatever the term is) since she has been back from maternity leave. She looks very appropriate, especially considering she flew on an Air Force plane rather than commercial. They are definitely not luxurious. I believe I read that is was a 3 to 4 hours flight, then the event, and the return flight . . . I totally get why she wore pants. They are dress pants, so much less fitted than skinny jeans. But I think part of it is Kate is in movement walking down stairs in front facing the photo. They look reasonably fitted in the back view. I am aware that dress pants fit differently than skinny jeans. I have looked at other photos not included here yet and there continues to be extra folds of fabric in the crotch area. It’s just my opinion, but I am certainly entitled to it. I agree dng MEI, I'd have preferred a skinny like she usually wears, or a straight-leg or cropped trouser. These just don't lay neatly. I agree MEI. Catherine's long torso is better suited with a cigarette pant or slim pant. The hollywood-style pant better suits someone with a curvier derriere. Perhaps with a tighter sweater or the blouse and nice belt to showcase her slim waist. Just needed definition somewhere. Whoah! Kate in trousers!! I predict alot of happy people out there!! I'm not sure I'm a 100% sold on the look but I like the change of pace and the general effect! And like the olive accessories! A nice mixture of new and repeat pieces. Hope they're having a great day today and so great that they're bringing stuff from the families! Yes, the trousers brigade will be happy with this one! Finally some professional pants! I am a member of the trouser brigade and am pleased indeed!! WOW! I like everything-the hair style, the blazer, the blouse, the trousers, the matching shoes and clutch. The only thing I don't like is William's brown shoes with that suit. Some nice black slip ons would look much better. Oh I love the look. I like it when she tries something new. I think the pants are navy but WOW!!! PANTS!!! I love it. That shade of green looks wonderful on her! I thought they looked navy also. In my opinion not good with olive green so hopefully it's the lighting & they're actually black but love the overall look. She looks so smart in pants. Oooh, I like the combo of navy and olive together. It’s different but not so much that she looks odd. Hooray! Something besides skinny jeans, dress or a gown. I am part of the trouser brigade, and I am doing a happy dance out here in California! appropriate and professional, but I much prefer her more feminine wardrobe choices. Yes!!! Pants!!! She looks amazing. Such a great look, such a great event! Yes! I was going to say just that. Very professional looking and very sharp, totally getting Queen Letitzia vibes. If you showed me this outfit with Kate’s head cropped and told me it was Letitizia I would believe (although she’s obviously shorter than Kate). Might this be the end of skinny jeans? If so, I'm all in favour. I say ‘yay’ to that! Let’s hope it’s indeed the end of painted jeans! I think she looks fabulous! I just think this is so attractive and beats last night's gown. I love the colors and the departure from skinny jeans. Love those green shoes. Looks like she and Meghan went shopping together. Just so good looking. See I see this as more Queen Letizia or Princess Mary than Meghan. Yes, I love those shoes. Usually when I see what Queen Letizia is wearing, I wish that Meghan would wear it, too. ) Her clothes see like the perfect cross between what Kate and Meghan wear. It's crazy to think that Kate or Meghan would pick a fight with the other. When we look at this outfit and thin "Meghan," it's obvious that Kate chose the with that purpose. I am a huge fan now of the MAM site, but I will always believe that Kate is a very, very nice person and is probably horrified at what is being speared at Meghan. I remember all the stories about Camilla and Kate "fighting," so I'm sure Kate can empathize. I'm still thinking about Carole's burgundy-colored shoes from the interview. And what she said about there being "a right way to dress." Other than HM, Carole is a great fashion role-model for Kate. I’m a bit mixed on the outfit. I like that she is wearing trousers, but something is throwing me off about it. And I can’t quite place what it is. Maybe the color combo? Finally, finally, FINALLY! Trousers and not skinny jeans! YES! That said, the fit of them does look a tiny bit off for me...and I'm a fan of more straight leg than wide leg, especially since Kate is so slim. But still...YES! Trousers! Agreed. Love the look, but straight leg pants would have made amore polished, professional look. Finally some new clothes in a different style!!! She looks great in this outfit! Love the whole thing from head to toe!! Especially her bag. I do believe that this departure in terms of style is no coincidence coming at this time. Kate does have a penchant for speaking through her clothes and therefore, I do believe that this outfit is purposefully Meghan-inspired. But it does suit her well. I think the 2 women will prove a buffer for each other & I think they will inspire each other. No matter what, they will have a lifetime bond that they could never share with any other friends! Only these 2 women will ever understand what it means to be married to the 2 brothers! Otherwise, I really don't think the jacket color and trouser color complement each other. I am also not sold on the Smythe cut-out design in the back. It does give a younger look tha the boxier jackets. I feel as though people have a penchant for speaking for Kate through her clothes. Sometimes pants are just pants. 🎶 Hallelujah, Hallelujah! 🎶 Finnally! Trousers! I’m so happy, so proud. The shot coming off the plane is great! So happy to see slacks besides skinny jeans! This is giving me Letizia vibes. No worries about a skirt flapping, de-planing--smart move! Nice look! I likethe change of style, but I dont think that trousers fit her properly. She looks strangely wide, in contrast to her slim frame the last couple of engagements. Especially from the back, the fit is somehow off. Nevertheless, I much prefer a not-so-good-fit to the routine skinny jeans! This look seems odd for me. Kate has a very feminine style and this look is not much. Maybe this is the quible. But she's happy and this engagement is very sweet and lovely. A looser fit has been trending in places like Tokyo for a while now. And I mean way-wide, think a pajama look. So perhaps this is on the edge of something new that is making its way west. Hard to say. But after a good deal of fitted fashion a larger and looser look will seem a bit "off." That is until everyone wears it. Yes! I prefer this look and not the skinny jeans/wedges. I think the trousers fits her properly and she looks great. But the outfit kinda emphasizes her boyish toned body frame. Maybe that’s why she looks wide. I had heard that flared pants are coming back in fashion, for the third time in my ever longer life... Sigh... I am not a huge fan of flared pants unless it is casual, linen, resort, PJ/homey style.. BUT, Kate looks great in these, and I salute her for making a bold fashion choice. Kate is having some fun with her fashion, and that I like. The front of her outfit looks unbelievably chic. The back, not so much, the pants look crinkled, cut in a bit, and I am since previously not a big fan of the cut out of that blazer. Personally, I think that Kate would look smarter in straight classic cut pants, or a bootleg, if they are still around. Maybe flared pants would look better on a slightly curvier figure, I think they seem to "hang" a bit on straight hips, that might just be my opinion, not at all criticism. Olive/army green and dark navy are colours that I think look great together though, especially mixed in with white. And the reason for the visit: FABULOUS!!!!!! The comment you are referring to is mine. I’m not asking for trousers that crawl into her girl bits, but in my opinion there is too much extra fabric in the crotch area as seen in the first photo posted. As I stated above, it’s only my opinion. I am entitled to my opinion even if if differs from others. Kate is finally wearing business style trousers in Navy, good choice. I feel she needs to shop around to get a trouser with a little less material in the leg area, otherwise the whole outfit with the combo of colors good choice. 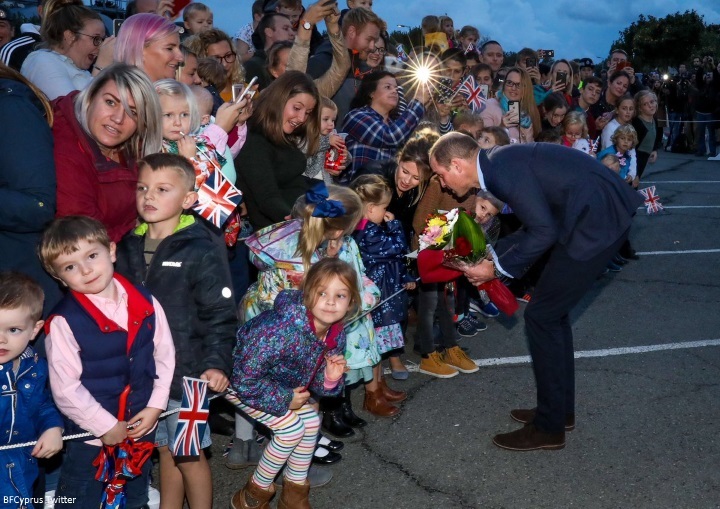 Now we need to work on William with his choice of color shoes and belts, he should have wore either black or Midnight Navy belt and shoes in suede. I've never looked for Kate in trousers, but she looks really well! And khaki is definitely her colour. The only thing I'd like to change is a colour of the pants: black will work much better with khaki. I would love to see her in some more tailored trousers (rather than this very wide leg). Somewhere in between these and the skinny jeans. Yes, the sort that Queen Letizia wears. Otherwise, she looks great. Duchess Kate looks fabulous as usual! Has she worn this blazer before? Love the whole outfit! I think she looks wonderful in pants and am excited when she actually wears them and am thankful they are not skinny jeans or pants. A wonderful engagement - a very special visit. 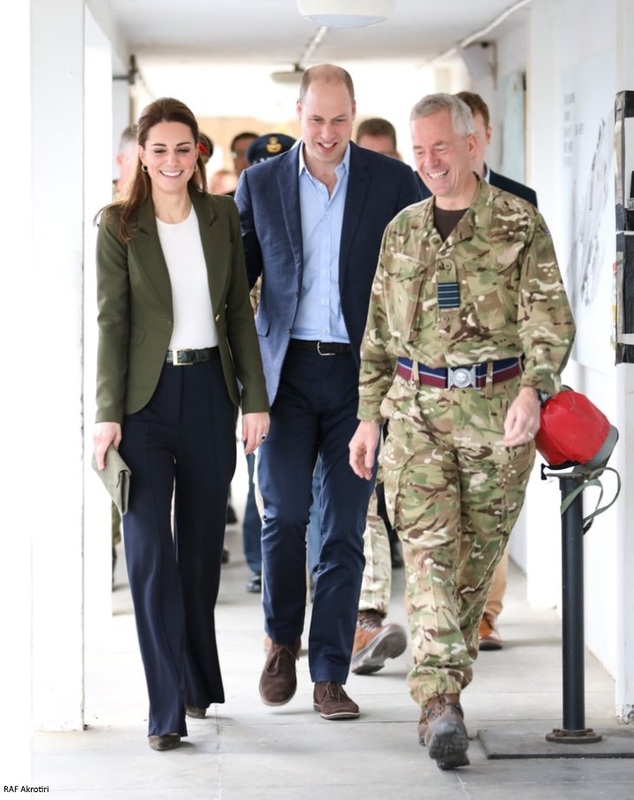 Given the RAF are wearing combat dress and flight suits it seems right Kate didn't dress too formally (although I wouldn't have minded - I think royals can always dress up a bit.) But she looks so nice in trousers that I'm glad she chose them and hope they replace the jeans for all but the most adventurous visits. The short jacket is a good shape on her and the coordinating colours make for good photos - she doesn't stand out which is somehow very Kate. Kate's hair has looked particularly nice on all three of these engagements. I like the belt too. Looking at the type of event something to business would not have worked, and while a flirty party dress would suit the occation, looking at the wind when they deplaned, it might not have suited the location. I am over the moon about the sharp, modern look in those fabulous trousers. What we’ve been waiting for through years of skin-tight jeans and those wedges. No worries about wardrobe malfunctions in the breeze for this confident, chic woman. Alleluia, the Duchess claims her best self. Yes, they were too long in the rise. Enough room for a man’s anatomy. Yay! Trousers! She looks great! I love this look!!!! I really love that blazer. It comes in a lot of colors and if I were her (and had her resources) I would buy one in every color. Me, too! :) I love the cutout at the back; it’s so distinctive. An excellent look for windswept travel day in Cyprus! What a couple of great tandem events. Kate looks very smart. Her great height and slimness allows her to carry off the style and cut of the trousers beautifully. Love the colour combination. Has anyone else noticed that Kate is becoming more regal in her wardrobe? Even in her casual clothes. I think she is acting more like a future queen. Especially in the past year. Love this look She always looks good but this my style I hate dress and not a huge fan of skinny jean for my self its fun to say Id where that. Looks like everyone there was very happy to see them. Not enough words to say how much I love the ensemble, the event and seeing these two. LOVE,LOVE,LOVE with hearts and balloons coming out of my head. 😃, Tammy! ❤️🎈I ove them, too. I knew the minute I saw she was wearing pants that the DOS comparison would come flying in. This is not the first time that DOC has worn pants (and I don't mean her skinny jeans) to a function. Really, what else would she wear to a military base to make the soldiers feel very comfortable with her? She looks professional and beautiful. Clearly this was a great choice and it was her choice. I agree!! Someone even said it was the ”Meghan effect”, as if!!! I think it's entirely possible that Kate would get some new fashion ideas from Meghan, Caroline. Just because Meghan isn't slated to be the next Queen Consort doesn't mean she and Kate can't or don't share tips and ideas. Sure, Kate has worn pants before, but she's mostly a dress gal, except for when she wears skinny pants, so it's not that far-fetched to think that maybe she's been a little influenced by her new sister-in-law. I really like this look on Kate. She looks professional and sophisticated. Because she is tall, she can really pull off the long, wide/flared leg trousers that she's wearing. I think she looks great. I cannot find anything wrong with this look, except the fact that I wish I could afford a Smythe blazer. LOL. I've always wanted one, since I first saw the Duchess in her navy Smythe blazer. Thanks for the post Charlotte. Thank you, thank you to who ever is now styling Kate. What a transformation to professional, smart, realistic dressing since her return to full time royal duty in her role. I would not tag her style as future queen looking. What does that mean anyway? I do think she has at times modeled HM in head to toe color and style forgetting that as a mentor HM was highly fashionable in her day looking back on photos. Her fashion statements are now relevant to the events she is attending and totally current in the times we live. I think her eyes have been opened to new possibilities in attire and it is to her advantage. We have waited a very long time for proper trousers and we have not been disappointed. I would have appreciated navy shoes but Kate does have need to over match color when accessorizing. Dressing like a queen doesn't mean dressing like the Queen. The Queen is in her 90s and of course, a young future queen is not going to dress exactly like her. In my opinion, Letizia is a great example for dressing as a modern queen. Anonymous, I do know that Kates clothing and HM clothing are not the same. Everyone know that!!! Kate does often dress head to toe in the same color much the same as HM. It is my understanding that HM does it to be seen as she is tiny in stature. Kate can been seen from great distance due to her tall stature. Additionally, Kate is not the queen and everyone knows that as well!!! Well, I don't think you really got my point, which was that Kate can dress like a (future) queen without dressing like Queen Elizabeth. This is a first comment in a while that someone has talked about the engagement and not what Kate was wearing. I know this is a fashion site but there is so much more than Kate and the trousers she is wearing. Or comparing her to other woman and how their style is influencing her. I love how W&K are branching out in their duties. I am looking forward to them hitting the ground running for next year and stepping up their charity work. I am looking forward to more engagements with Meghan. I do think they are going to come together for something. I also think the Cambridges will be with the Queen this year for Christmas, her and Philip are getting older, and you never know how many more they (he) has left. This is my first time commenting in a while. But I do love this site, and Mad About Meghan, and the work Charlotte puts in it. This is not a fashion site. There's another one for that, which I actually never visit. Of course, Kate's clothes are what people end up talking about the most. But this has always been about so much more than what Kate is wearing. Thus the subtitle "Following the Life and Style of the Duchess of Cambridge." Having said that, I do tend myself to comment most often on the clothes. It's because I don't have much time to really thoroughly read every post and watch every video, so I try not to comment on anything if I haven't fully immersed myself in the topic of the post, with the exception of engagements regarding mental health, which is important to me. Anyway, the clothes are easy to comment on because all I have to do is look at the photos! Fabulous look for her. Professional, yet casual and chic. Kate looks amazing. Love her hair too. Wonderful event. I love how she dressed to fit the palette of the people she was visiting. Her outfit doesn't stand out against theirs--she's just blending in. That's a lovely subtle touch. Yeah ! Catherine wearing trousers !!!!! Greatest look of all ! I personally I do not like wide leg trousers, but never mind , she does look modern , she does look like a woman of her time ! And an easy look to meet people , bend to speak to children , she looks really gooooooood ! A clever person is always open to take lessons from others, so I am sure that W&K are influenced by H&M and the other way around. But the things you are mentioning W&K have been doing since their first engagements together. Yes they are not known for PDA but over the years they have displayed some very subtle but distinct gestures. 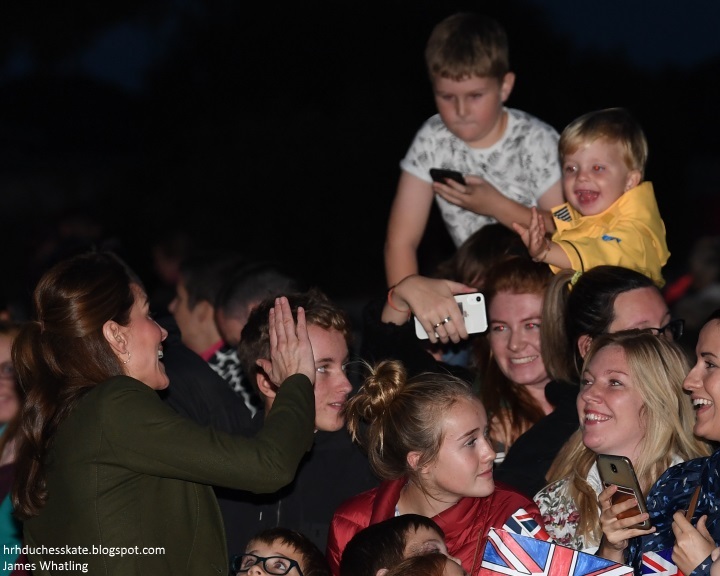 There are hundreds of photos of William’s hand at Kate’s back as they are entering/leaving engagements. And then they have a way to connect with their eyes that is almost not PG especially at the start of engagements. They have always done these things, it was just never newsworthy. Honestly this is pretty typical of how they have acted together since they got married. He's always placed a guiding hand on the small of her back. They've always shared special looks and I've always felt that they hold whole conversations with each other when they lock eyes at events like other couples who've been together for years. So honestly I don't see any changes in their behavior towards one another in public. 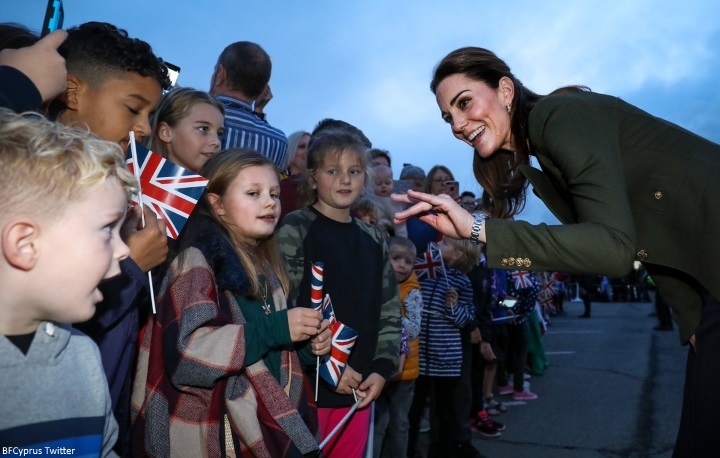 I do see a change in Kate's demeanor and confidence since her return from maternity leave. I agree with you, QofS and Courtney. Smiling and looking in each other's eyes has always been there between W+K, I know because I've often noticed it and thought it so lovely! It shows their mutual love and the quality of their relationship. Not every couple is like that after several years of marriage. I suspect it might be the other way round: because we often see H+M's PDA we may notice these subtle loving gestures more often with W+K. TROUSERS TROUSERS TROUSERS!!!!!! HOORAY FOR TROUSERS! They may not be the most flattering pair, but she looks so great! I hope we see more! 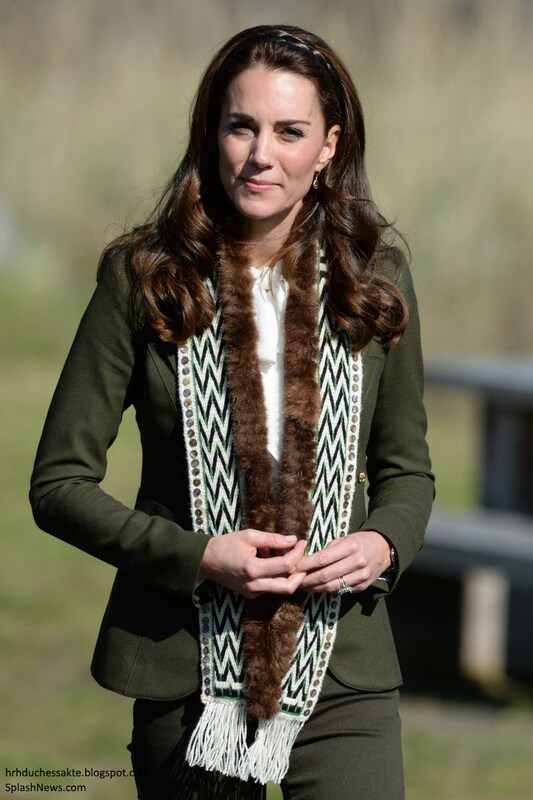 Olive/khaki green is definitely Kate’s colour! It’s my favourite go-to shade in my wardrobe :) I love her accessories here. The trousers are interesting but I would’ve preferred a more slimline cut. She looks very nice. Like the blazer with the high waisted pants. Do not think pants have anything to do with Meghan. At last. . .great pants and not the skinny jeans! Love her hair this way, too. Great look! It’s a Christmas miracle! After 7 years FINALLY a pair of pants! Honest to god trousers! And she looks fantastic! I hope she starts adding more pants into her wardrobe. So many options in looks! Woohoo! Gorgeous! Sleek, stylish and professional! I love this look!! It is amazing! She looks young and fresh for a mother of 3! Hope to see more looks like this. She looks she looks beautiful as usual. This shade of green is stunning. I am not thrilled about the wide leg slacks on anyone. Gorgeous! Love the polished casual look. She seems even taller in the slacks. Very modern-day Kate Hepburn. Classic. I think it is a rather nice thought that two ladies, in this case, the Duchesses of Cambridge and Sussex, would talk clothes and actually enjoy some of the fashion styles of each other. No competition; just two ladies enjoying a conversation on fashion. Charlotte, thank you for sharing research info on Cyprus RAF Operations and CESSAC. The Duchess of Cambridge was dressed appropriately casual and looked lovely and relaxed. Omg omg omg!! Pants!! So excited:) I’m not sold on the bell bottom width, would have been more flattering with straight legs but PTL no skinny jeans!! I don’t think she should wear pants all the time but a flattering trouser is a great look fit her! Made my day!! Great look on Kate and yeeesss to the fantastic pants/trousers hope to see her in many more she looks great in them! Oh I love her outfit, and her hair, and her shoes. It's fun to see her in something casual yet still elegant. That color looks great on her. A refreshing change. Two great outfits in a row. The beautiful gown for the diplomatic reception is one of Kate’s two or three best ever. This combination is also perfect. One quibble, that weird cutout in the back of the blazer, which is a beautiful color on Kate. I loved it in Canada and love it here with the wide pants, except the back. Kate’s hair is also very well styled for this event. The party and coordinated visit to troops were lovely. I hope they are continued each year. Has she worn trousers before for events? Follow up: I meant wide leg trousers. Has she worn them before? This is a nice change! No skinny jeans or blowing skirts this time. I like the olive blazer but the shoes is not working for me. Too matchy matchy. It’s a wonderful visit for the military and their families especially at this time of the year. 1. I may be old fashioned, but I’ve always been taught that shoes should be the same shade or darker than pants. So to me, her shoe color is a faux paux and looks bad. Should be black shoes as I think these are black slacks. I don’t know if the fashion rules have changed but this is what I prefer as I tend to be more conservative. 2. 99.9% of the time, Kate dresses correctly for her body type - today she missed. Wide leg pants and bell-bottoms are not suitable for Kate as she is so slim and slim-hipped. Wide-bottomed pants are for ladies with wider hips/thighs to balance the look. The same way a larger lady like myself should not wear skinny jeans - I would look lopsided and like an upside down triangle. Although this doesn’t stop many from doing this and it’s really sad (if any here are guilty, please look in the mirror and look at your overall shape and you’ll see what I mean - skinny jeans accentuate large hips/thighs, making a big problem worse). For Kate’s figure, since she is so slim, she is drowning in these pants and it makes her look like a large stick figure. Her legs actually remind me of that American child clay character Gumby when she is standing still - not a good look. She should have straight leg or trousers that taper in at the ankle. Meghan can get away with both types because she is slim enough but has more rounded hips to balance the wide leg bottoms plus she wears her legs more fitted as Kate’s here are looser - Kate’s figure is too slim hipped for this style, unfortunately, and just doesn’t present her fabulous figure off. Otherwise, I think she looks great from the waist up and hope she keeps trying! Shoes can definitely be any colour Lynn. Kate's pants/trousers are navy. Otherwise I agree with you. While Kate did not have to "learn" from Meghan to wear these pants, I think the fact that so many comments have been related to how they remind us of Meghan's style means that Kate would not mind such comments and would thus be showing us again that there is no feud. Kate is so versatile in terms of style and colors that it is hard for Meghan to "copy". I would like to see all the RF women wear exactly the same thing on their Christmas walk-about! OMG wide leg trousers?!?! I love it! Totally shocked that she opted for something other than her usually skinny jeans/trousers. Very cute! Catherine looks fabulous I love everything. I haven't had a chance to comment yet. I think this is a really nice, new look for Kate. It's professional and out of her box, without looking matronly. I don't love massive wide-legged pants like these, but she pulls them off and hey -- it's something different!! For everyone rolling their eyes about Kate getting fashion ideas from Meghan -- I think it's completely possible that the two might share ideas every once in awhile, or at the very least get some fresh ideas from seeing the other's wardrobe. I don't think it's a slight in the least to Kate to suggest she might have taken a page from Meghan's book and vice versa. Why does it have to be a bad thing? It doesn't make Kate less regal or less of a future Queen Consort. Good grief. Soooo much better than the frumpy-looking (sorry!) skirt from yesterday! I believe we are watching a young woman transform into a new chapter of her life. Let's not forget that Kate came upon the "royal" scene in her late teens, endured ruthless media cruelty for a better part of her 20's, and then married. For those of us nearer Diana's age, we remember her transforming from young princess, to mother, to distraught wife, to an independent woman. Diana really began to shine in the last few years of her life. Kate is making the same transition. We've all enjoyed the young wife, fit mother and now emerging woman. It's a joy to watch her bloom in her own time and in a totally authentic manner. I really don't think her evolution has anything to do with anyone else. I think part of the evolution is expanding her fashion choices, and possibly those wide white pants that Meghan wore made a teeny little impression. I'm sure that everyone who wears something "fashionable" makes an impression. Again, I love that Kate wore such different pants (for her) and the fact that "Meghan inspired" is being touted so much at least means that it doesn't bother Kate for people to think such. Kate can wear everything so well that it's hard to "copy" her and still look good. Sorry, but I don't think 'Meghan inspired' has anything to do with the fashion choices Catherine makes ... it's a media hype to get someone to click on an article. Both women have their own fashion style and adding something new doesn't mean they are trying to emulate anyone else. As for the outfit for this particular event, I love it. It's classic, professional, and comfortable to wear for a day full of travel and various activities. Olive and navy are such a classic color pairing and I have always loved the blazer with the back hem cut out detail giving it interest. I think it is possible that the trousers look like bell bottoms due to Catherine's legs being as slender as they are. Charlotte, if you ever do a 'caption this' competition, please choose the fourth photograph down in this particular blog post as one of the photographs! The expression on Catherine's face makes me smile every time I see it :-).